STARKVILLE, Miss. – Oklahoma State freshman Jaden Hobbs – playing with a big, bulky leg brace and averaging a grand total of four points per game – had already stunned Syracuse with three straight 3-pointers in quick succession. Somehow, she found herself wide open for a fourth, even if it was several feet behind the arc. That didn’t faze her a bit. She let it fly right in front of the Cowgirls’ bench and her teammates exploded into more cheers as it splashed through the net. “I guess we could call that a heat check,” Hobbs said with a grin. The 5-foot-8 Hobbs scored a career-high 27 points to almost single-handedly carry No. 9 seed Oklahoma State past No. 8 Syracuse 84-57 in the first round of the NCAA Tournament on Saturday. Hobbs made 8 of 9 3-point attempts, blowing the game open by making four 3-pointers in quick succession late in the third quarter. She had never before scored more than 12 points in a game during her college career. 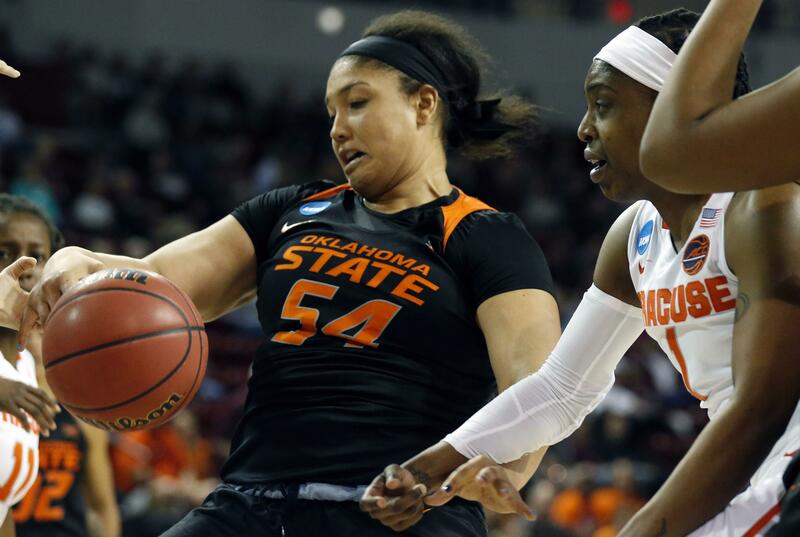 “She picked a great time to break out,” Oklahoma State coach Jim Littell said. Oklahoma State (21-10) ended the first half on an 11-0 run to take a 40-32 halftime lead. The rally was punctuated in the final seconds by a perfect pass from Loryn Goodwin to Maria Castro, who made a 3-pointer as the buzzer sounded. The Cowgirls never trailed again, thanks to solid defense and Hobbs. Oklahoma State shot 13 of 23 (56 percent) from 3-point range. Goodwin and Kaylee Jensen both scored 19 points for the Cowgirls. Jensen added 12 rebounds, including seven on the offensive end of the court. “We played as good as we could possibly play and did a lot of things right,” Littell said. “We ran into a buzzsaw,” Syracuse coach Quentin Hillsman said. Syracuse was led by Miranda Drummond, who scored 24 points on 8 of 16 shooting, including 7 of 12 from 3-point range. But the Orange struggled on defense. The reason Hobbs has that big brace on her left leg is because she suffered a torn ACL and meniscus in a preseason game before last season. October 30th, 2016 to be exact. That made the 27 points she scored on Saturday even sweeter. “I’m honestly speechless,” Hobbs said. “I never imagined this would be my path. Starting last year, the original freshman year, I never thought (the injury) would happen to me, but it’s one of the best things to ever happen to me. Oklahoma State: The Cowgirls did a good job of slowing down Syracuse’s fast-paced offense and now will get another shot to take down Mississippi State, which beat Nicholls 95-50 on Saturday. Oklahoma State played Mississippi State very tough back in December before losing 79-76. It was the Bulldogs’ smallest margin of victory during their 32-game winning streak to start the season. Syracuse: The Orange started fast, but their offense bogged down against Oklahoma State’s defense starting in the second quarter. Mangakahia, who led the team in scoring and assists this season, was limited to just eight points and seven assists and had six turnovers. Oklahoma State faces Mississippi State in the second round. Published: March 17, 2018, 6:34 p.m.